As Toronto enters 2017, the city is once again facing financial difficulties. While City Council looks at the same tired methods for trying to balance the budget, Torontoist has come up with five exciting new revenue streams that could actually make a difference. Selling off assets is the quickest way to make money, so why not start by privatizing Toronto’s bike lanes? The City could be exploiting these valuable strips of real estate to make wads of cash while improving everyone’s daily commute. Instead of battling through rush hour traffic along the Bloor Street bike lane, you could be gliding along Absolut Vodka’s VIP Bike Lounge or cruising down Chanel No. 5 Presents: An Urban Pedalling Experience. And once we let the free market loose, it will be only a matter of time before we see luxury-sized bike lanes, which could accommodate not just cyclists, but also cars, heavy trucks, and much-needed parking spaces. 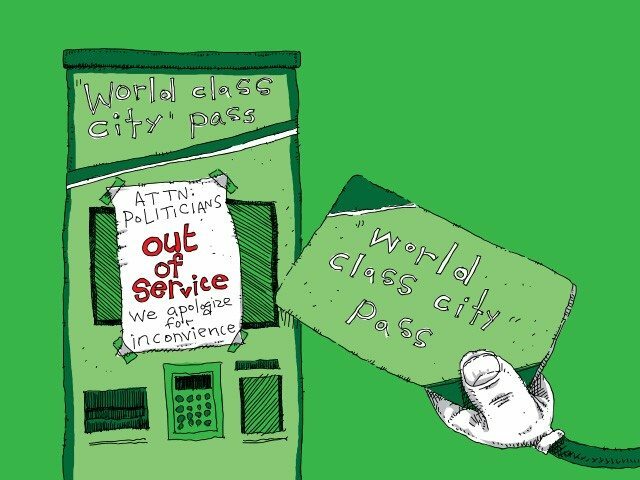 This charge would apply every time someone publicly refers to Toronto as a “world-class city.” Whether it was a local politician pandering to the electorate by declaring Toronto a “world-class city” or an uninspired opinion columnist trotting out “world-class city” to fill out their word count, it would cost for the privilege of using this cliché. All the money generated from the “world-class city” user fee could go towards funding our borderline third-world transit system. For too long, pedestrians have been clogging Toronto’s sidewalks and crosswalks without paying so much as a cent. This freeloading has got to stop. In the future, anyone who wishes to walk around Toronto should have to pay for the honour with this registration tax. New taxes are never popular, but on the upside, people wearing sensible, rubber-soled shoes will be entitled to a modest rebate. Some say the Renaissance-era Catholic Church was corrupt for selling indulgences, but I say you only have to look at St. Peter’s Basilica to see the tactic got results. So why not do something similar in Toronto? For a nominal cost, Torontonians would purchase an indulgence that would help pay for the new station set to be built in Scarborough. In return for purchasing an indulgence, John Tory would personally forgive you for a grievous sin, like criticizing his Scarborough subway extension plan.